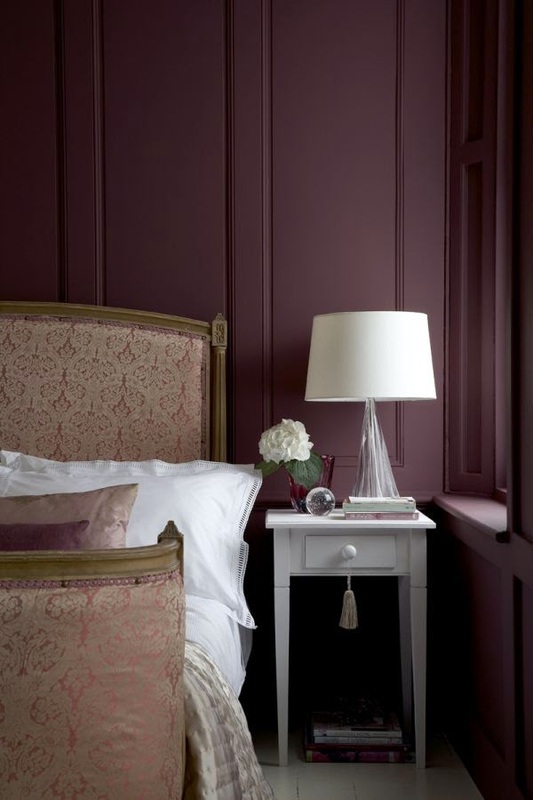 Sometimes a dark wallpapered wall is the only thing the bedroom walls might need. Isn’t this design lovely? There is plenty of visual interest in the pops of fuchsia and turquoise, and the subtle pattern on the dark wallpaper provides an impeccable – and highly romantic – backdrop. 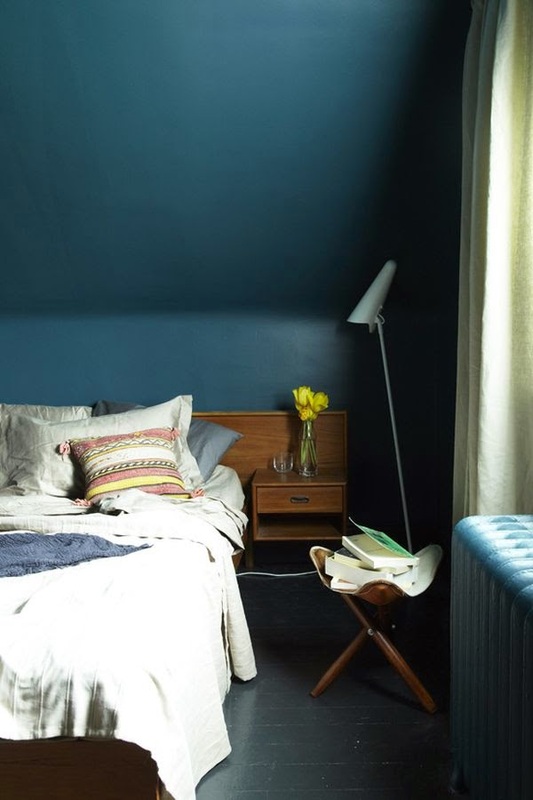 This bedroom wall color reminds me, in the best way, of freshly laid asphalt. There is depth amid the simplicity. A light floor, paired with even lighter bedding, help to keep this tastefully minimal and clean-lined space balanced and inviting. 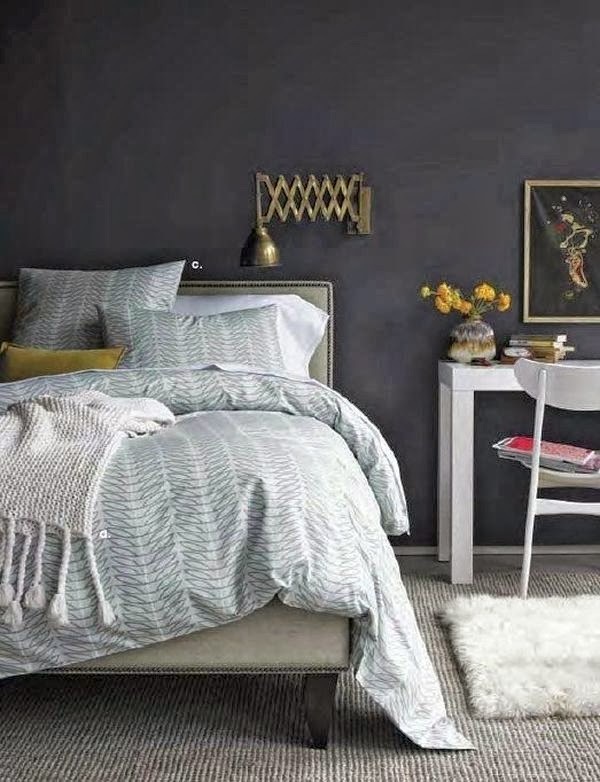 Just in case you were starting to wonder if dark walls in the bedroom required a more somber palette altogether, this Kate Spade guest bedroom comes to the rescue! 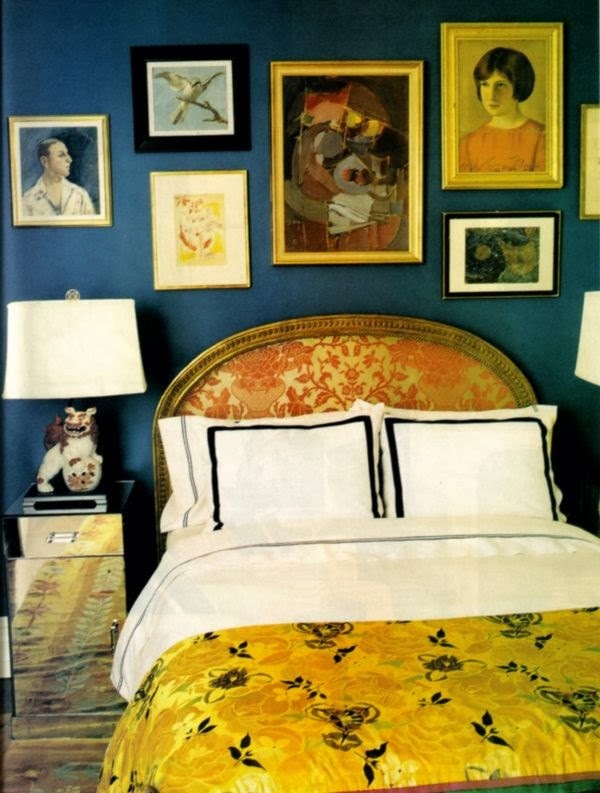 Rich, vibrant golds bring life and whimsy to the more serious navy walls for an altogether friendly and relaxing space. 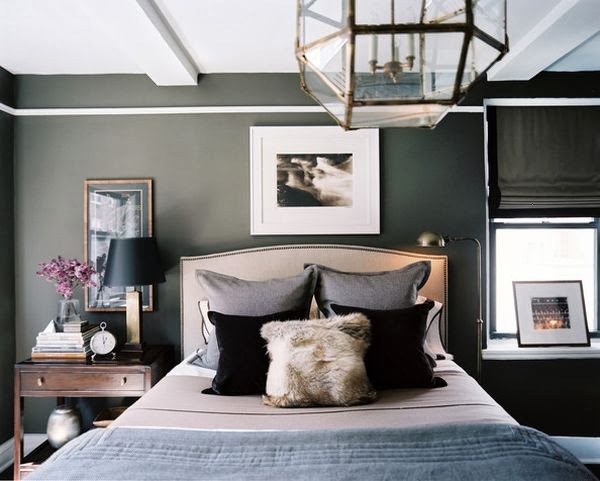 Angled ceilings can be tricky in bedrooms, but painting them entirely a moody color, like this dark peacock, is a fantastic way to go. This strategy not only embraces the inherent coziness factor, but it also fools the eye into thinking there is more space, as the (sloped) ceiling melds into the wall. Isn’t this the most beautiful greeny-grey? 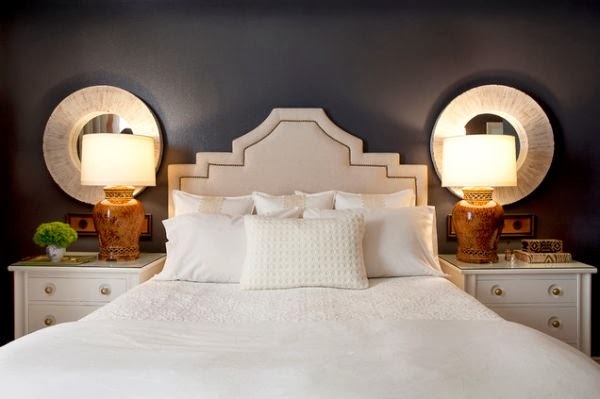 Not overwhelmed by dark color because ceiling is painted white to lighten the mood. Interesting lines everywhere, and touches of brass and gold (in lamps, pendant, frames) add shine. Another instance in which dark walls can (should!) go unadorned is when the walls themselves are architecturally detailed, as is the case in this beautiful charcoal bedroom. Moulding all the way around the room stands is subtle yet highlighted when dark walls force textural elements to the forefront. 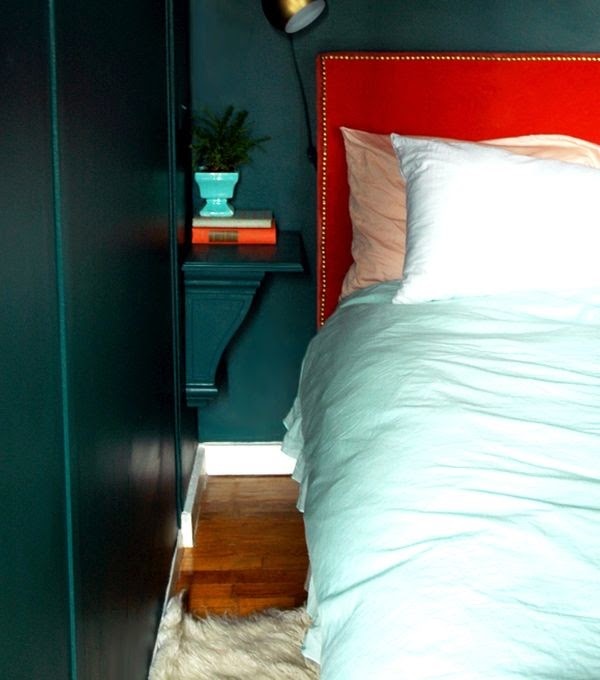 If your bedroom has more in common with a closet than with other bedrooms (translation: it’s teensy tiny), a rich dark color like this Bavarian forest green will do wonders! Ceiling, walls, and built-in shelving are painted the same shade so they become the perfectly cozy background to your peaceful retreat. In bedrooms where plenty of natural light abounds, going dark on the walls is a good way to keep things chic and sophisticated. This dark chocolate color is both romantic and serene, yet the potentially oppressive factor is kept in check with the windows and their textural curtains. I sometimes forget about burgundy, or wine, or whatever you might call this beautiful, rich shade of berry. But the dark color on these walls (and window trim, for seamlessness) absolutely enfolds you in warmth and a sense of home here.